The bulk of the audience will never consider any technique, unless the technique is loudly flagged as a technique and as challenging or deliberate. Most art, textual, visual, or otherwise, is taken as naturally-occurring, naturally as it is. And, many an artist will encourage this, talking of a story naturally progressing, or a painting discovering itself on the canvas. Even the technique-inclined or analysis addicts often let the most subtle applications and the good effects of those applied techniques go through them, effecting them, without recognizing the techniques as techniques or as effective. 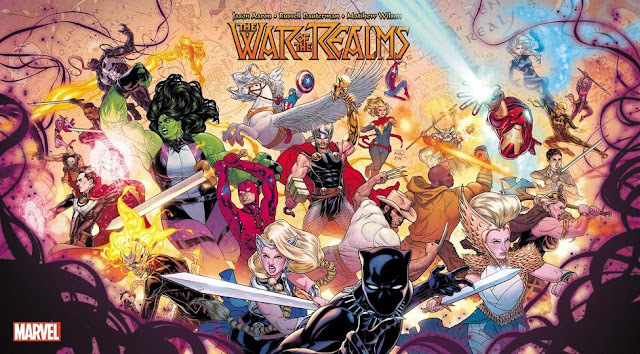 Collage and montage exist outside comics, but nothing can present that sequential sense and immediately present so many slivers of time at once the way comics can. The basic nature of multi-panel comics means that on one page, we see multiple times at once. In a movie, on stage, in music, we have action and then reaction, but on a comics page, both may be visible simultaneously, with only our eye moving along the narrative path determining that our attention moves from one time to the next. This actually enhances the comedy, since we know what is coming, yet also delay its occurrence by seeing but not reading the consequence before we are through with the event. Pearls Before Swine, Urusei Yatsura and “A Gym Dandy” all use this to great effect. In this example from Rumiko Takahashi’s Urusei Yatsura, “Spring Fever”, the largest panel is at the center of the page, all the way across, showing a cherry-blossom spirit smacking two characters with hammers. It is unlikely anyone coming to this page would not see this immediately, but our training in reading draws our eye up to the top panels, draws our attention there, so that we can see the two-panel build up of scenario, preparation, and then the largest panel, the payoff. Even if when you get there, you laugh the most, you probably chuckle or snort when you turn to the page because it’s just there, being all big and noticeable. 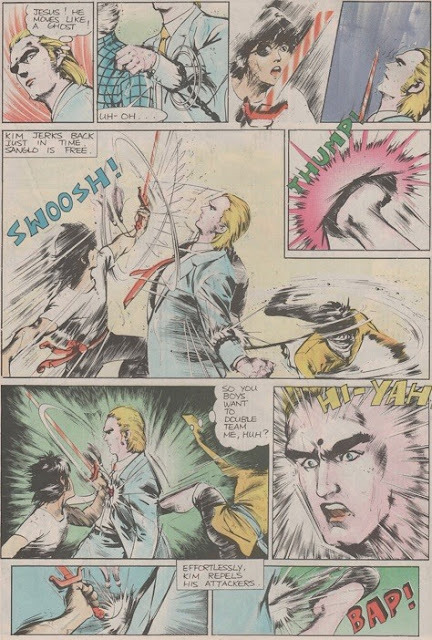 And, again, in the lower third of the page, the final two panels are people being hit again, and we see them, clearly, but we read the panels building up to them, the scenario-establishing panel and then the preparation panel first, only them coming to the action and, instead of another reaction/scenario-setting panel, another action panel. In a TV show, this would probably fall flat. You can’t keep hammering on extra beats like that, especially with comedy, or they become montage or so rhythmic they’re staid. By showing us all the cards simultaneously, we know what to expect even if we only consciously read the cards one at a time. We see the spread and are prepped to accordingly react. In Dan DeCarlo’s “A Gym Dandy”, the fact we can see Albert’s fall at first glance adds frisson as we read his attempt to extract kite from tree, slipping, falling, hitting the sidewalk as we read down the page. Making faces recognizable is printing money. That’s why whole industries are coopted into machines to produce stars. It’s why we respond positively to celebrity endorsements or branding on products that have no logical connection to what the person is famous for. Recognizable faces draw our attention and play with our emotions. Why do so many strip characters wear the same clothes all the time? For the same reason Osamu Tezuka started using the same character designs in all of his works, simply recasting these imaginary actors into the available roles: recognition sells. I don’t just mean “sells,” in the sense of product endorsements or spinoff products like t-shirts or inflatable rafts. 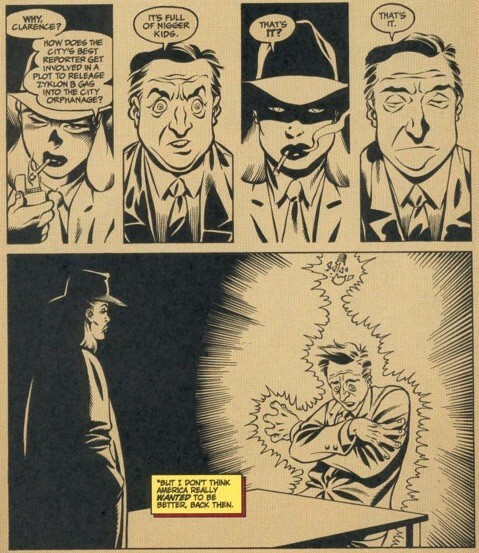 A comic can sell emotion; it can sell familiarity, quality, and connection. Neal Adams and Winn Mortimer launched Toyboy with an issue of clear and clearly placed faces. 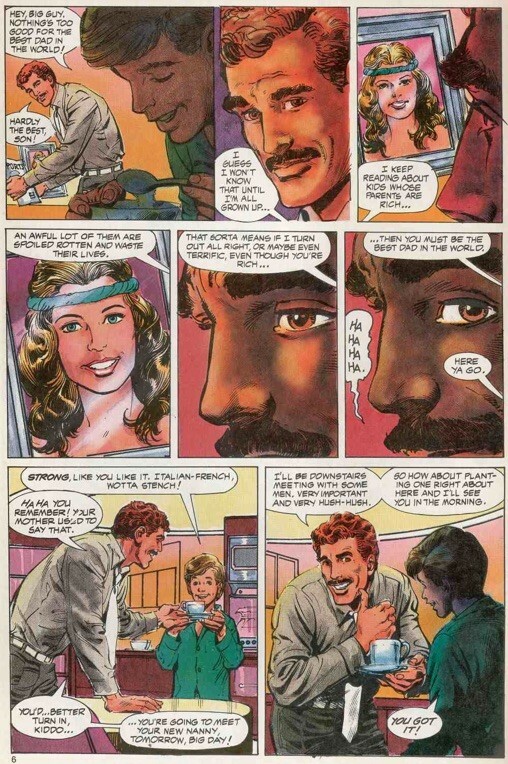 The followup artist, Trevor Von Eeden, quietly moved away from this during his first two or three issues, but Adams works hard to establish a face to face connection between his characters and us, the audience. I think it’s safe to say Adams is a more commercially minded artist than Von Eeden, and something like Toyboy is going to need not only to be presented but sold to the readers. Every panel is carefully orchestrated to keep heads visible, faces forward or in clear profile, so that by the end of the issue, we know this kid through and through. We can visualize readily his father, his new nanny, et al. Every character’s look is sold to us. Promoted and clearly presented. 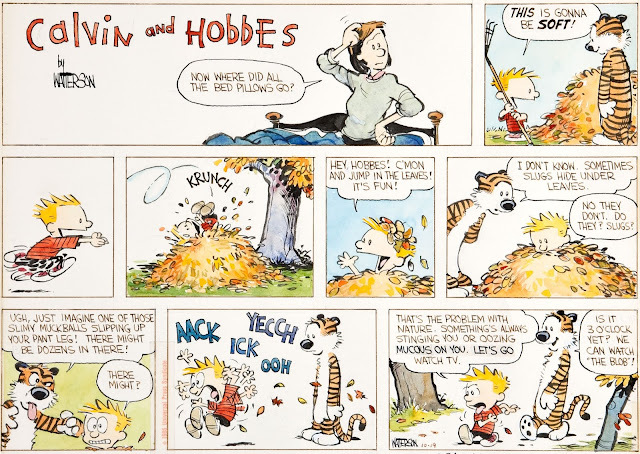 Compare this Sunday Calvin and Hobbes strip by Bill Watterson, and note that here, too, the faces are kept in clear emphasis regardless of situation or other objects in each panel. Leaves are not going to overtake Calvin. A tree is not going to stand in the way. The height difference is not going to crop one or the other awkwardly or in a way that could obscure boy or tiger. How to keep the techniques strong, present familiar faces clearly and set up a page as a beautiful thing unto itself, without everything feeling limited and same-same? Movies have become more and more a patchwork of styles and genres, with Quentin Tarantino and others bastardizing together quilts of sensibilities into something that feels bigger and truer and more full of punches. 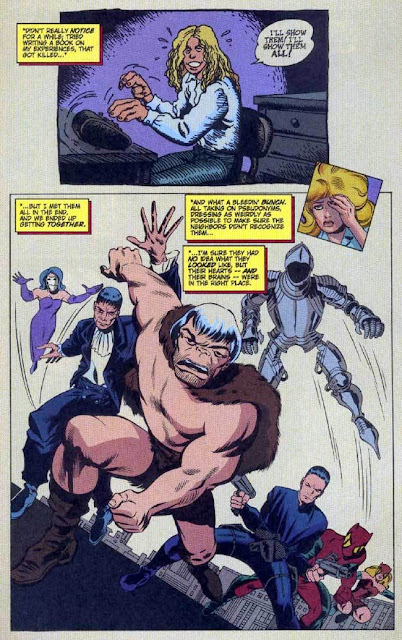 Paintings were doing this bastardizing before comics, but comics have been doing it at least as far back as Jack Kirby and Stan Lee jamming giant monsters, space adventure, body horror, and superheroes together in the first issue of Fantastic Four. Two of the most common and remarkably effective methods of this quilting are for the comic to mash up various pastiches or when a comic has multiple authors collaborating on small segments of a single story, known as the jam comic. In “Who Watches the Weatherman?” (Stormwatch #44), Tom Raney, Gina Going, and Laura Martin bring to life Warren Ellis’ script by rendering each era of the 20th Century in the styles of comics from the time. These are pastiches, no mistake, each mimicking not only the techniques and tone, but a clear and exaggerated look for each, but the quieter techniques of the artists mirrored are included seamlessly, bringing it out of being merely parodic or a sequence of nostalgic snapshots. My favorite page in the whole comic is one following the protagonist’s decision to lead a superhero team in the Sixties, illustrated as three progressing panels in three different yet contemporary Sixties styles. First, at top, the anxious, thick-lined underground comix look, then a small, romantic inset of Jenny’s emoting face, and taking up nearly the entire page, a group shot of superheroes in a style halfway between Jack Kirby and John Buscema (with some costume designs reminiscent of Wally Wood and Jim Steranko). Line densities, methods for delineation, body language, cartooning hallmarks all change between each panel, and to be entirely honest, the average pastiche of Sixties comics would never have bothered with more than the superhero. It’s packing so much information into a single page beyond the basic narrative happenings, while flavoring those entirely, and even if one style is not to your personal taste, it’s going to jump past and keep moving to new things. 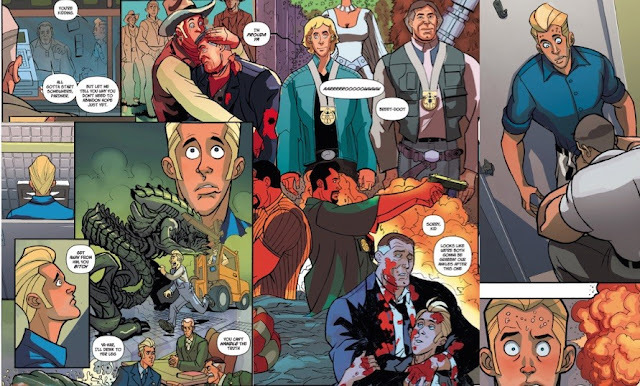 I do think jam comics have an easier time, in general, of these kinds of change ups, and Troll Bridge, written by Dan Brereton, is an exemplary example of jam comics at its most cool. Featuring pages by Stan Sakai, Jill Thompson, Bruce Timm, Art Adams, Steve Purcell, Adam Warren and more, Troll Bridge keeps changing and growing, scenes play against one another, forward with the narrative, but also reverberating back and forth between the different sections, and since each artist is working on their own (with the writer and artist on the closing pages, Brereton), they can push their strengths forward, no concern of matching a style or producing house work. I love Dan Brereton. He’s both an excellent writer and an amazing visual artist and a genius at making comics. But, Troll Bridge is a great breath between lyrics, like when Prince would have a secondary singer come in for awhile on a song and not back him up, but take over for awhile. It is still, always, obviously under Prince’s control, it’s Prince’s show, and here, this is Brereton’s show, but these contributors are awesome and Brereton trusts them and lets them shine. Helps them shine by giving them a fresh, Brereton-lit-and-designed stage to perform on. And, in turn, they illuminate more of his strengths and glory, not only one by one, but as an enclave of styles and emphases. There are go-fast boats, traditionally good for smuggling in booze and drugs, and making Miami Vice episodes more exciting. Go-fast comics rush in story and events before radar can latch on and we track what’s happening. Ma Wing-shing was nineteen when he started Blood Sword, already a veteran comics author with Little Tough Guys, Five Brothers, Destroyer and others under his belt. Blood Sword, then, became a hypergolic mixture of mature confidence and hungry exuberance. Soap romance, war story, fight comic, and bildungsroman, the comic doesn’t run forward so much as ram its way through all barriers forward. 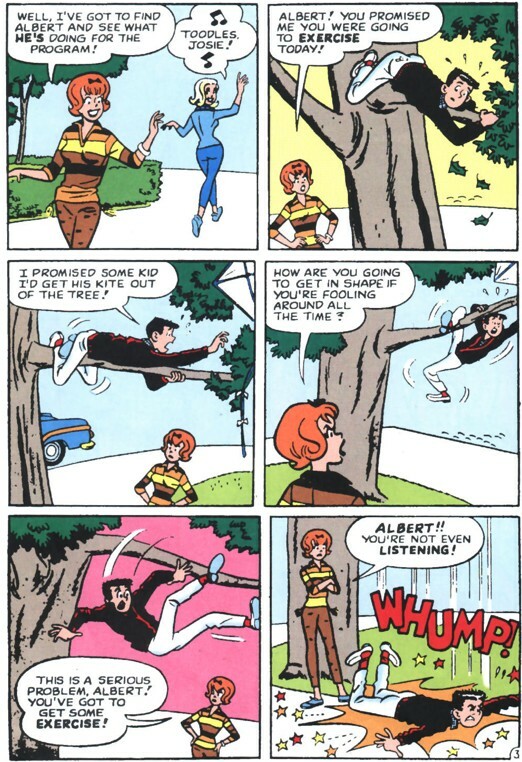 Almost every page has nine to twelve panels, never framed into balanced, equal spaces like Alan Moore or Jack Kirby comics often would be, but in streaks and points made of subtle angles and unpredictable panel overlaps. The page layout, itself, becomes a conflict, a fight, a dance of impacts and counter-relations that keep the eye and the read zipping over the page, absorbing everything at a far more breakneck pace than logic actually requires. You could read a page of Blood Sword slowly and carefully, but it is designed to discourage slow study. The comic makes you read fast. Garth Ennis and Mark Dos Santos use the above four techniques together in A Train Called Love, utilizing the power of cause and effect being on the same page, presenting us with identifiable and highlighted faces, easily read emotions, stylized and varied ways to illustrate elements, and masterfully pace the audience with the articulation and arrangement of their panels and characters. Alongside all of that, they are astonishingly good with juxtaposing and correlating panels and elements into something bigger, denser, deeper than the sum of the parts alone. I’ve had to cut out the scenes between, otherwise we would be reposting the whole issue, but hopefully the three pages excerpted together demonstrate this armada of elements and techniques becoming a fugue. 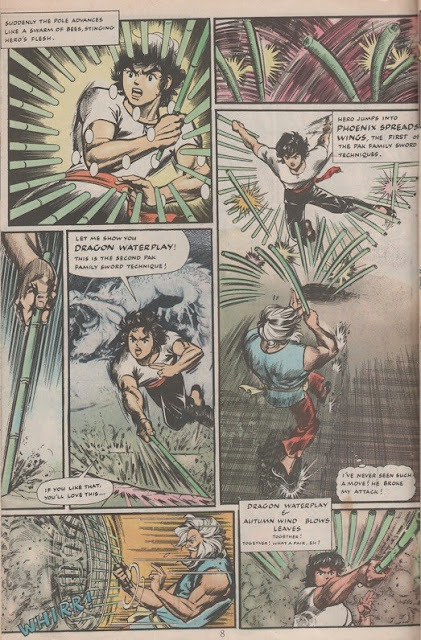 The two men talking in the two-page spread, frame a collage of manly action movie moments with them as the characters. The opening panel presents both faces, but as a reflection as we are behind them. Even allowing us to be behind them, they get to face forward. The older guy, sitting on the can, blowing him. And, then a starship zooms away from an explosion. Again, a movie can do some of this, and a short story could do some of it, but nothing can do it as comics can, as Ennis and Dos Santos have. The reader can easily take in so much more of the page than what they are reading, each page, and we can more quickly and easily flip back and reread here than we can rewind a few minutes of the movie, though we can do that. We can skim a comic faster and probably take much more in on the skim than skimming a page of prose.